Terri Sapienza, reviewing this item in today's Washington Post Home section, wrote, "Our vote for the most clever summer item so far goes to Grandin Road's Outdoor Half-Umbrella." 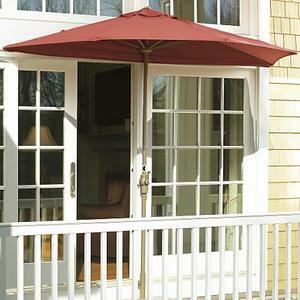 Our innovative Outdoor Half-Umbrella is the perfect shade over a door, on a balcony or along walls or windows. 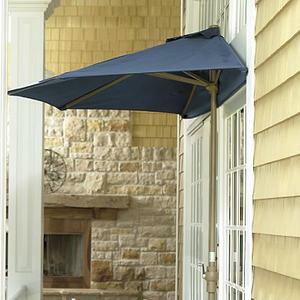 This patio umbrella is great for anywhere you want to add shade without taking up too much space. • Sturdy base keeps the half-canopy flush against any vertical surface — no attachment needed! Neptune (Blue), Paprika (Red), Citron (Green), Ivory, Antique Beige, Kona (Brown). Umbrella (9'H x 9.5'W x 4.5'D): $299. sir,i would like to know more about your product. Four hundred dollars for a half-(assed) umbrella and base, just for some shade???? My Tweety & Sylvester parasol would keep you in the dark with style and flair -- &10.00. Garbage bag stretched over an old TV roof antenna -- $2.50.